People&apos;s square is a spectacular space in the heart of the city. It is a garden-type open space surrounded by buildings and facilities for administration, cultural activities, transportation and commerce. The People&apos;s Park, People&apos;s Mansion and Shanghai Museum are sitting on the central axis. The central square lies between People&apos;s Mansion and Shanghai Museum with two smaller squares on each side. The total area covers up to 1,806,600 square meters. 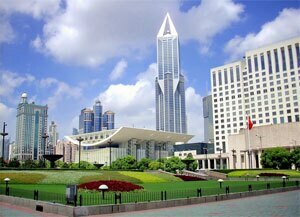 It is arranged with a 320-square-meter water fountain, a Shanghai map and the ground is laid with granite stone. There are 36 lights with stereo around the central square and 6 pieces of relief which reflect history and culture of Shanghai. Two small pieces of grasslands are decorated with flower terraces and sculptures. The large square is circled with a green belt made up of camphor trees, pines and shrubbery. A stone path, lined with chairs, wanders through the green belt. People&apos;s Square is also the converging point where metro Line 1 meets Line 2. From the square you can reach many shopping centers. Leaving metro Line 1, tourists enter a street where famous shops from Hong Kong assemble and get to Dimei shopping mall, a shopping center like a maze. Going from metro Line 2, you can come to an old street lined with old-styled jewelry shops, restaurants and teahouses, which reminds you of the old days. From the entrance to metro Line 1 to the No. 9 entrance of metro Line 2, lay an underground department store and a restaurant from which you can arrive at New World City, another shopping mall. Just around the corner is the famous Nanjing Road. Evaluation: when in festivals or holidays, it is one of the most popular places. The people&apos;s square area represents big portion of Shanghai&apos;s image.